Belated Happy Father’s Day greetings to your dad. Wow! That’s a lot of food/meat for two but hey, knowing you, you would not have a problem finishing all of it. LOL!!! Haven’t been here for a while now – I hear they charge GST 6%. Yup, Ming Mei Shi charges 6% GST now. It’s not too bad, the prices on average are still pretty reasonable. Haha! Yeah, I can actually eat a lot, but you know that already. The durians in Balik Pulau are awesome, I’ve been there before. Yeah, I can actually put down a lot of food, which surprises a lot of people who hasn’t seen me done it. I’ve actually participated in (amateur) eating competitions. You and me only have our precious dads left! We better be good sons while we still can. The photo of you both warms my heart lah! Indeed, we only have our dads left and the time we have is very precious. Happy Father’s Day to your dad. When you say Chinese food, and then I see lamb shank, hehe, feels funny pulak.. I’m having “kiu soong” in mind, like all your other dishes except that lamb shank.. But whatever is it, janji sedap.. Lots of food and meat for two wor, nice..
You know how some Chinese restaurants have “curry”? It’s not authentic Indian curry but it’s Chinese style curry. This is the same thing, it’s Chinese style rendang. It’s really very good. 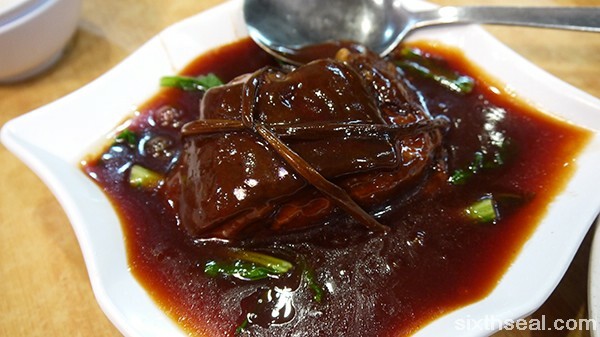 The other dishes were good too but the Dongpo Pork is usually better (too lean this time). LOL the exchange between you and your dad. so cute. He’s in a lot of ways the total opposite of me, I’m more like my late mom (in looks/features and personality) but I admire my dad immensely for his personality traits. He’s a very good person. That’s his smile, he says he doesn’t have a big smile but I think part of it has been due to my mom’s cancer and passing too. 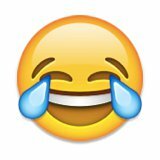 Prior to that, I’ve seen him laugh and smile, less after my mom got sick and even rarer after she died. I’m sure he still misses her badly, they’re a good couple. 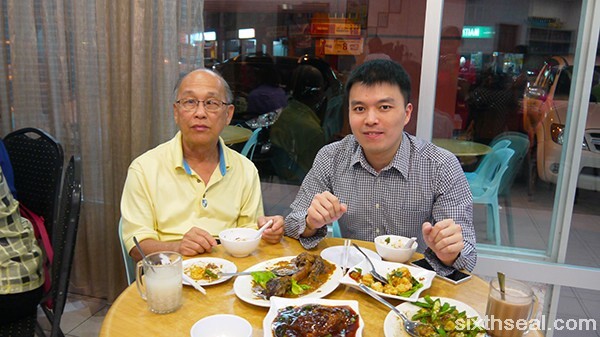 You flew back just to celebrate Father’s Day with your father – how nice and thoughtful of you. 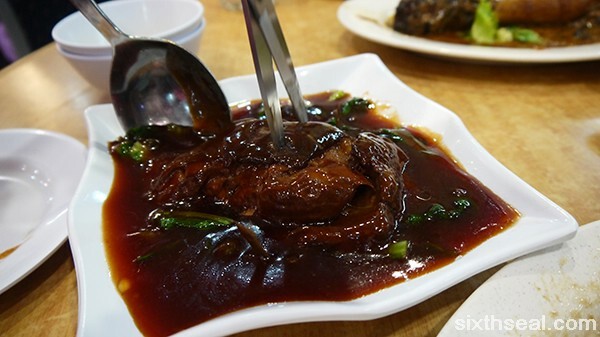 Can the Cinnamon Lamb Shank be considered as Chinese food? The four bean vegetable dish that I usually eat has petai, long bean, four angled bean and brinjal. Yup, he usually spends his time in Singapore but he comes back sometimes and I like to spend time with him coz I know he still misses my mom a lot. I also arranged to do some work stuff at this time so it’s a very productive trip. 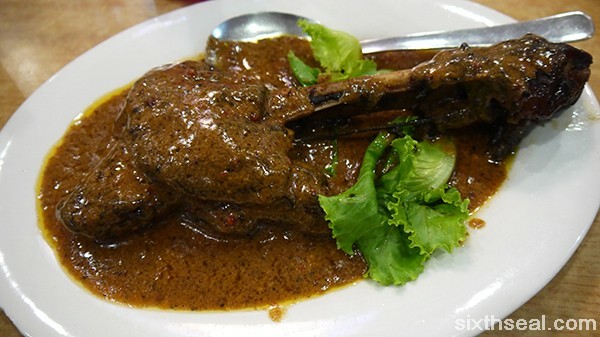 The lamb shank is a Chinese version of rendang, so it’s still Chinese food, just like Chinese curry. This place is pure Chinese cuisine, no fusion, but a few dishes (like this) has some elements from other cultures. I’ve seen many different 4 bean vegetables too, brinjal isn’t a bean though. 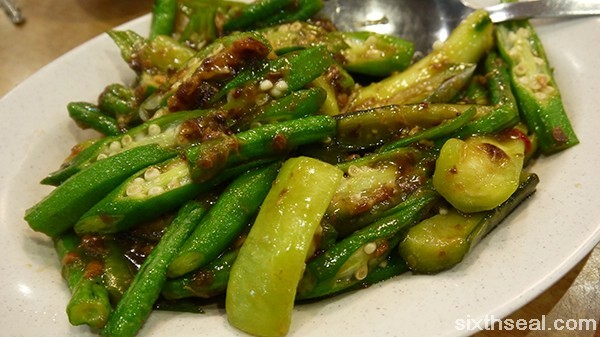 Four angled beans and petai is not so popular here, have eaten that in tai chow in KL but the vegetables locals here prefer generally doesn’t extend to those two. I hardly ever see anyone order four angled bean or petai in Chinese restaurants here.